Happy Friday everyone . I hope your December is going well so far and you are getting your Christmas prep done. 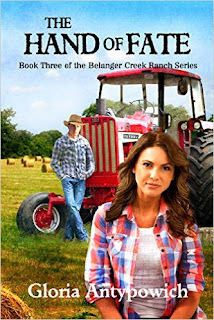 Today we are reviewing HAND OF FATE(The Belanger Creek Ranch series book 3 ) by Gloria Antypowich. Thirty-eight-year-old Christina Holmes is the office manager at Swift Current Accounting and Bookkeeping Services. On the surface, she is a happy person that everyone likes, but in her heart, she carries pain. She has MRHK syndrome. Her marriage had deteriorated because of the rare congenital condition, and it ended in humiliation for her. The experience is a secret that Christina has not shared with anyone since she came to Swift Current. She has avoided intimate relationships, feeling less than a woman, and ashamed of the hand that nature dealt her. She has allowed her condition to define her, making her certain that no one will love her as she is. This is the third book in a series that I absolutely adore . This story revolves around Tim and Christina . They are the best of friends but there is something deeper between them . The secrets that each of them harbor will take their relationship from friends to the love that defies all. They have the Thompson family 's support , they are family to them . The help comes in so many different ways . As the family supports and helps them in every way possible . They show how much family means and what a family is willing to do to help out their own . The whole crew is back in this book, the main characters Tim and Christina are such complex characters . Christina is the sweetest woman that you can ever imagine. She is loving and kind, loves children. But she can't have any due to MRKH syndrome which means that she can't have children.. She is also so strong and doesn't let anyone or anything stand in her way . Not even her pig headed best friend Tim . He has some issues but when he realizes that he has loved Christina , he is in whole hearted and will do anything for his Christina . They also work through the mystery of the picture and what it means . They also have help from the rest of the farm family . Even the biggest surprise of all, well there are actually two surprises . I am not going to tell you what they are . You will have to read the book to find out . But they are awesome . The whole crew is back Colt , Frank. Shaun lee , Brad and Ollie and Ellie. We also meet a couple of new characters Sarah , Taylor and Grayson . Trust me you will fall in love with all these characters. This book had me in tears in so many spots, the author gave us such a loving and emotional story . I think I cried more in this book because of the reaction to Christina not having children . It hit a soft spot with me, and I related to her sooo much . The author did a great job in researching both the medical and emotional aspects of MRKH syndrome. The research paid off big time, you find yourself reading a emotional love story between two people , that will over come anything and everything . I love this author and he style of no nonsense writing . I also love the fact that she is writing about a province that I love and know about . She takes us on a ride through south western Saskatchewan . 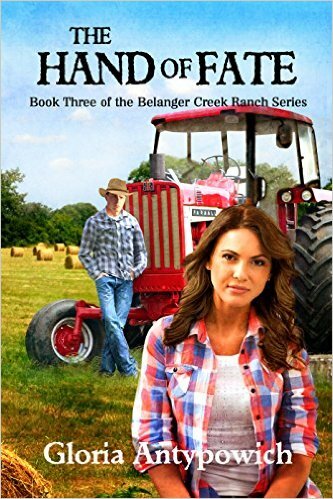 She paints a great picture of ranching and farming life with a close knit family of people that aren't related by blood but by the heart and love. So if you want a sweet series about friends and family that will do anything to help each other out . Throw in romance and love these are the books for you . This can be read as a stand alone but I suggest you read the whole series and get to know the whole gang .